Mere hours Niantic appeared on the stage at Apple’s iPhone event to show off its new Apple Watch app, Nintendo and The Pokemon Company announced the release date for Pokemon Go’s wearable: the Pokemon GO Plus. It’s only a week away. 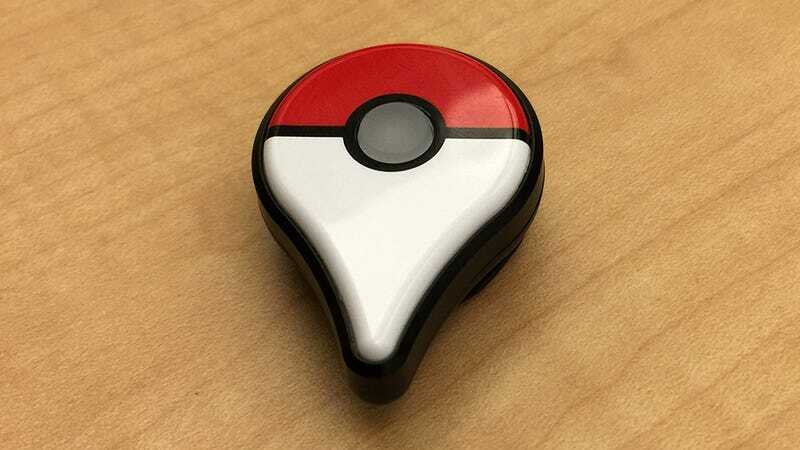 There is no detail on pricing, but the wearable, which looks like a Pokeball styled map pin, is little more than a hunk of plastic that vibrates and flashes when any activity occurs in the Pokemon Go app. It also allows you to catch Pokemon without pulling out your phone—but only if you’ve caught that particular type of Pokemon previously. The Pokemon GO Plus connects to your phone (either iOS or Android) via Bluetooth version 4.0 and will be available in most of the world (excluding some unnamed South American countries) September 16. This is exciting if you still play Pokemon Go, which has over 500 million downloads. However the active number of players is currently dropping, so maybe double check with your geriatric parents to see if their still playing before dropping mystery amounts of dollars on the device for them as a gift.